The paintings came pretty easy today, so I just kept painting. Some interesting color combinations resulted. 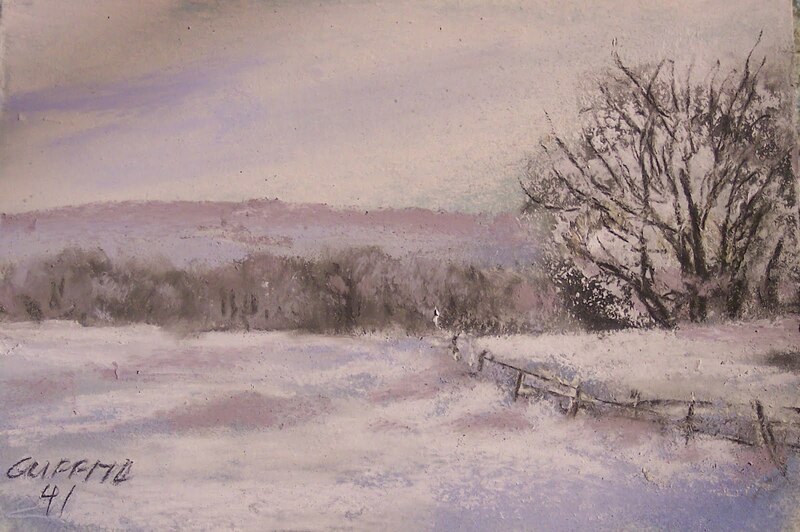 I am a little obsessed with snow scenes. Liked this one ok. Want to do one that is foggy. We know this should be easy because of the many days of foggy weather here every winter. And that dram might just be best played out with a camera and not a stick or two of pastel. On Facebook today there was an ad for Jerry’s Artorama. That a good place to buy supplies and they give some additional discounts to buyers who are on line with Facebook. The paintings number to 42 now. So I should have close to if not the complete 100 by the time of the Willow show in Walla Walla and therefore plenty to chose from! As a side note…Sommerset Studio publishes interesting magazines for artists…some are more fine craft in nature, some are for fabric art, stamping/scrapbook art, etc. Not too long ago they started publishing “Artful Blogging” a very interesting work that is dedicated to artists who blog and represent their art on their blog sites. It’s generally a good read and helpful for art blogs. So with that said, I am going to sit down, watch a little of the Olympics and do a little “Artful Blogging”! 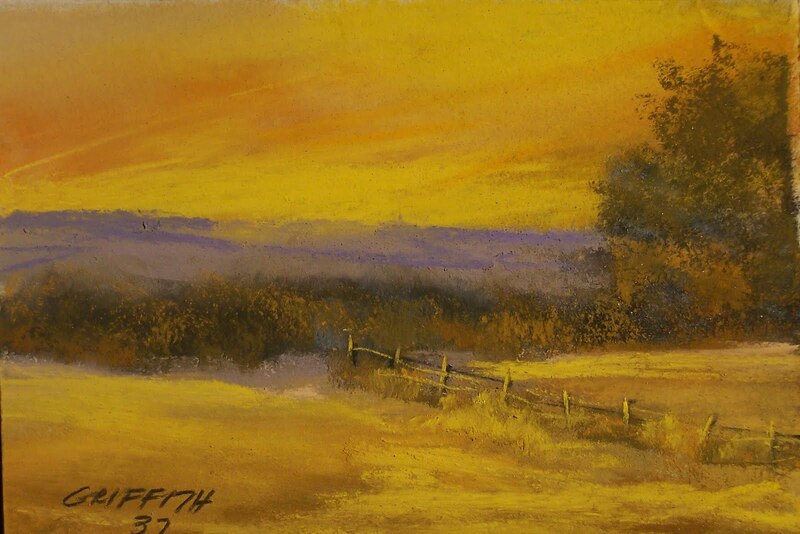 Probably one of my favorite times of day to paint is a sunset, just to be able to express that warm toned color onto paper gives me a good feeling. This is pretty dramatically golden, but I am working in some unusual, not necessarily realistic color….but for a sunset…it works, I think. At the Willow show in Walla Walla this April/May, I will show a collection of these little works…so yesterday I bought a bunch of small (5×7″), black frames for them. With a small neutral mat, I think they will look good. I am going to try my best to get the full 100 done before then, as I want to photograph them all together on the wall, unframed, just 100 little pictures, all hanging, just the same (! )…Then I will select maybe 10 or so for this show. So with that being said, I better get to painting! Check out the PastelNews.com site….Mario is sharing, with the author’s blessing, a chapter by chapter in their entirety, of a pastel technique publication. Go to the website and roam around in it and then thank Mario for all the time and energy he puts into this site. It’s awesome. so with that said…. This is a journey! Every time I sit down to work on one of these I have to THINK about color and what I can do to make this one a little different from the last one and maybe learn something in the process. This one took some work. It took some workable fixative. It took some creativity. I wanted to achieve that twilight in the snow look, which I think I did ok. 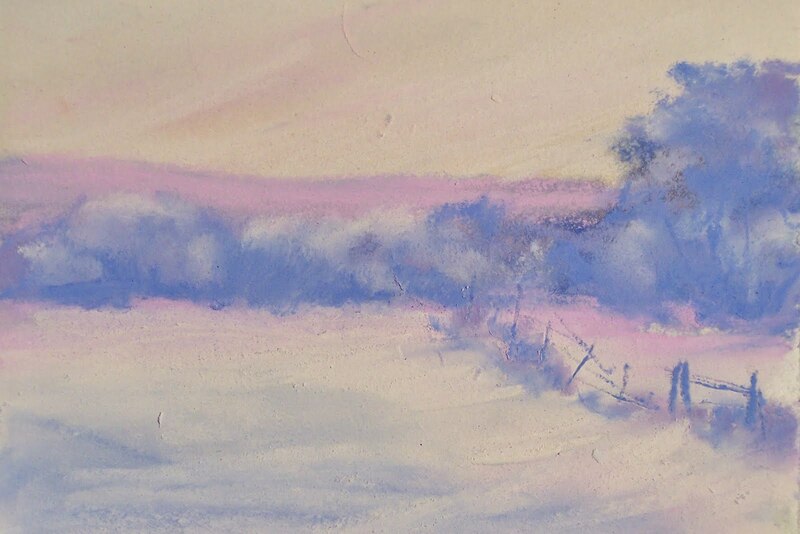 I have another twilight snow scene in my mind to work on…maybe more cooler colors. This does have that frosty look which I liked. 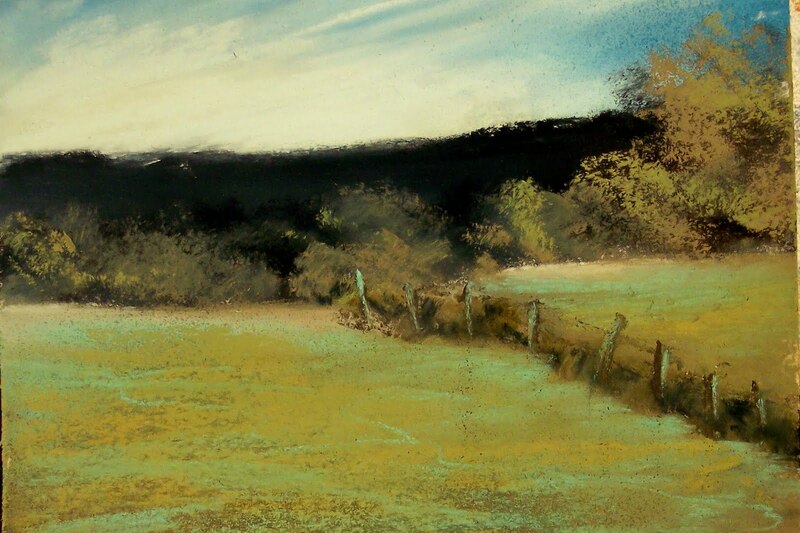 There is a lot of pastel on this little piece of Wallis paper! It look some work to get the trees to look like I wanted them. The new edition of the NW Gallery Publication is out and in the mail. It is a beautiful publication and represents the artists well. I got an email from a Oregon coast gallery interested in representing my work as a result of the publication being sent to them. That’s what we want! If you are interested in getting NWGallery of Artists let me know and I will get you added to the list. 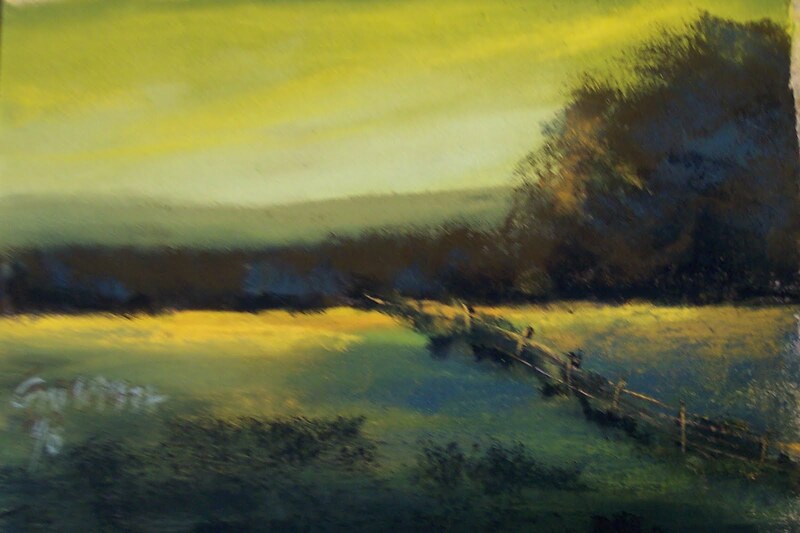 Happy painting…This is a long weekend for some of us…so make the most of it and PAINT!!! This is why I like purples. It adds such a depth and intensity to a painting. I don’t remember without going out and looking at the number of this one…but it’s a Unison purple…I think from the “dark” collection. It is a definite shadow color. then lay it next to some oranges and goldens and you have that complimentary thing going on. So I have an invite, thanks to my Chris who is always looking out for his Mom and some place to show her work, at the quick draw event at the Miles City Bucking Horse Sale in May. This is a huge event for this eastern Montana town. It’s like the Pendleton roundup in Pendleton, OR…The visitors for the event greatly outnumber the residents of these towns. Anyway, he knows somebody who knows somebody who made the invite to me. This is a big challenge. I love doing quick draws…but this one is one half an hour to complete! Many that I do are a hour in time to complete the painting. Well, it won’t be 24×30 in size! After drawing is complete, you have 10 minutes to put the paintings in a frame and it’s then ready for the auction! Looking forward to this! I visited with my friend Bambi who is a very creative person and a fine artist, whether she thinks so or not. 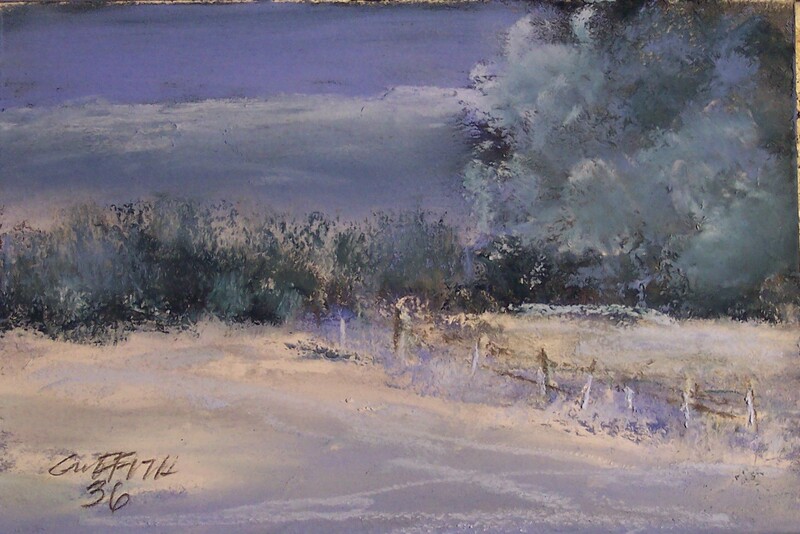 She graciously offered up her studio for one of my workshops a while ago and we had a fine time painting there. I told her I had gotten 35 of the little works completed and she asked if I had learned anything….?? ?…well yes…and so I told her about the paper and different pastels and my fear that I might run out of ideas before I reached 100. We talked about color a little and how some colors make the distant hills look like mountains in the far distance or some, like these two, appear to be hills just on the other side of that creek which is beyond the trees. Did you know there was a creek there?? We talked a little about her project for her son’s wedding – a “family tree” that all the guests stamp and sign…I hope to see the finished work and will post it if she will let me. I read more of the articles on Mario’s PastelNews website. Loved the snow scenes he has currently posted. Check it out if you haven’t already. So with this said, I am not too afraid that I can’t get to finish 100 little paintings…what I am wondering is what and how I am storing them in! The quest continues, inching toward the 100 number. I had a moment of panic, thinking I can’t possibly get to 100 of these. But then I rationalised that 30+ are completed and they seemed to get finished without a lot of stress! 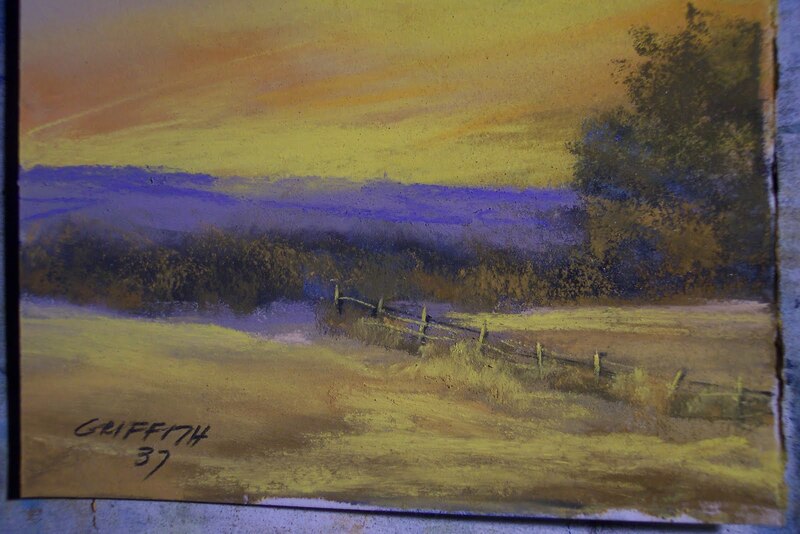 For these I continued to use the Richeson pastels with the exception of the Sennelier #463. 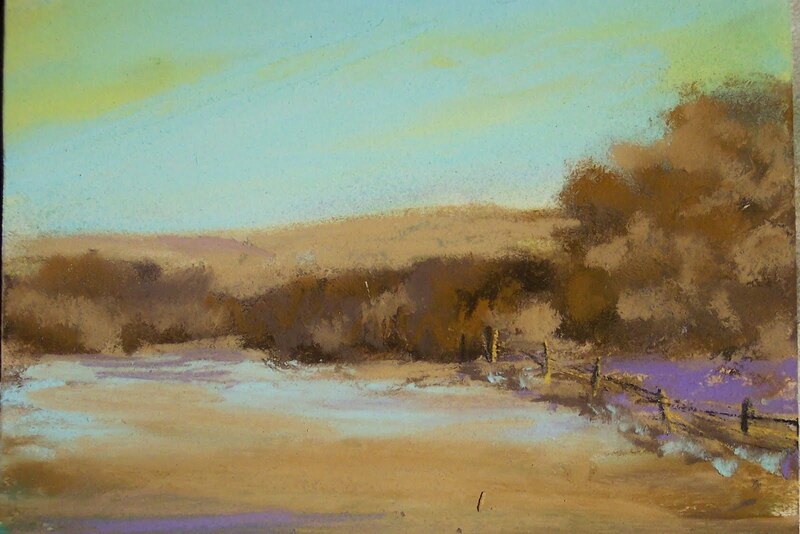 I like the Richeson pastels, how they lay down on the paper and their color. I have a small set of only 24, I believe, so there certainly may be more options with this brand than I am aware of. Again, with the Wallis paper, they work well. There is a new post from PastelNews.com…good articles in it. Do check it out…well done…hats off to Mario and his site. the title of this blog makes no sense unless you perhaps watched the first couple of seasons of Weeds on Showtime. The goofy, off-key song was about little houses in suburbia, CA, all the same only different colors…so go figure…my Series of 100…little pictures, all the same except in color. I worked these images with a new pastel brand…Richeson pastels. 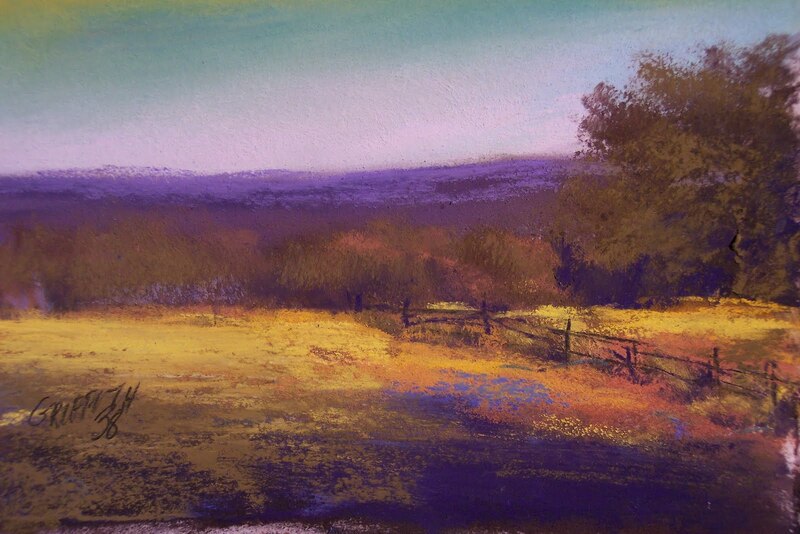 They offered a nice set of landscape pastels through Dakota Art Pastels (my favorite pastel store in the world), so decided to try them. The set is a quite pastelish set…what I would call “pretty” colors in a lot of pastel shades…pinks and blues, blue greens, warm browns, yellows and brilliant greens and lavenders. So I did one in really just blue, cream and pink. My least favorite. 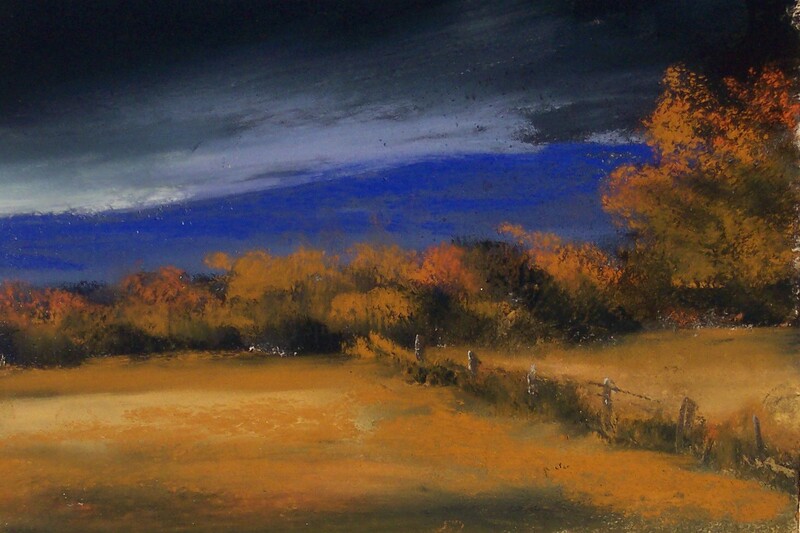 I do like however, how the pastel works on the Wallis paper. The colors are rich and I only wished for some killer blues like 463- Sennelier – so dark it is almost black. This little study is my least favorite as I was scanning the series so far. I might go back, add some workable fix to the blue trees and make it frosty. 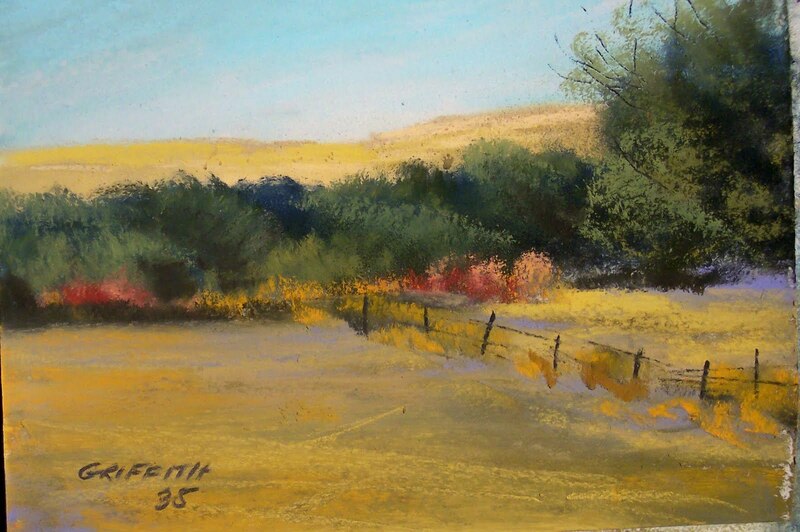 the next one that I did #31 was a study with a mix of different pastel brands and using the favorite 463 blue for the distant hills and background for brush and trees. I can’t get past it’s richness and how it causes the image to “pop”. 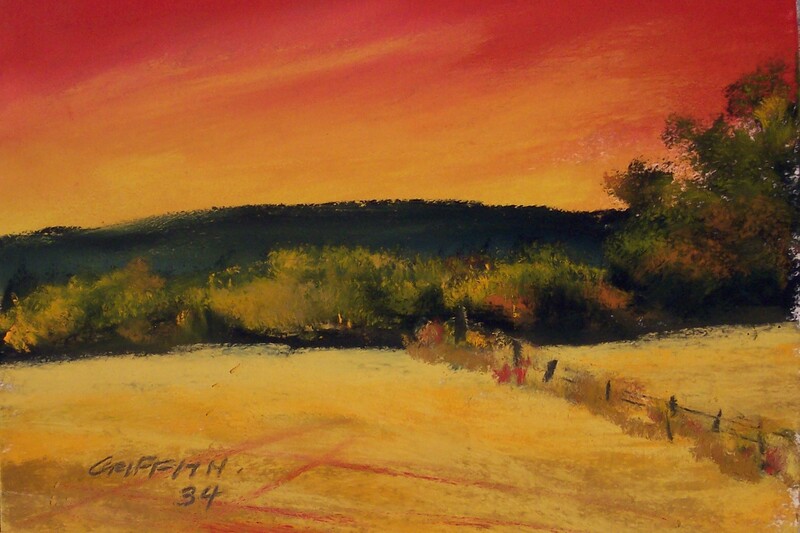 I will use the Richeson pastels, however along with the others that are favorites. 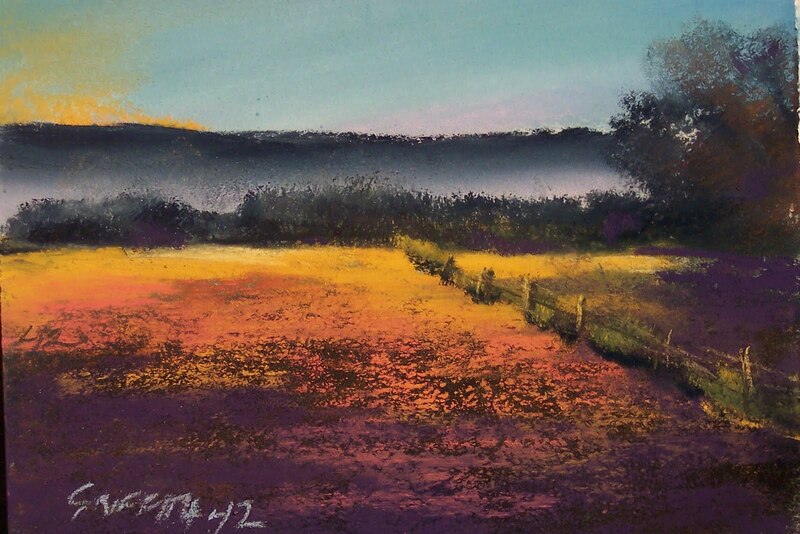 I hope to get to some place that has open stock of these pastels, because I am certain that there is darker darks etc to be had! So as the fog settles in today; I ignored it painting. Was not even a bother. I was however, thinking of the beautiful day we had yesterday with the sun bright in the sky; the mountains dark and the sky a wonderful blue! We are off to the Hospice Annual Event to raise money for this organization. Looking forward to visiting with friends and sitting through the live auction. 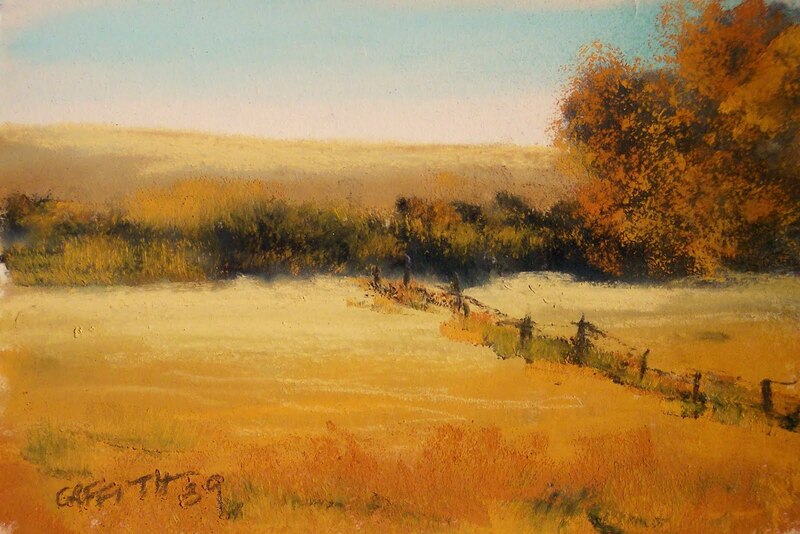 “Cottonwoods” was my donation to the event and hopefully it will garner a nice sum of money for this worthy cause!